Hokkaido Milk Bread or Japanese Milk Bread is the softest and lightest bread you will make in your kitchen. The bread is sweet and soft, delicious enough to eat without any topping. Whenever my family goes up to Canada for day trips we always buy this bread from the asian supermarket and end up eating some of it before we get home. The bread also freezes incredibly well and would be delicious as French Toast. 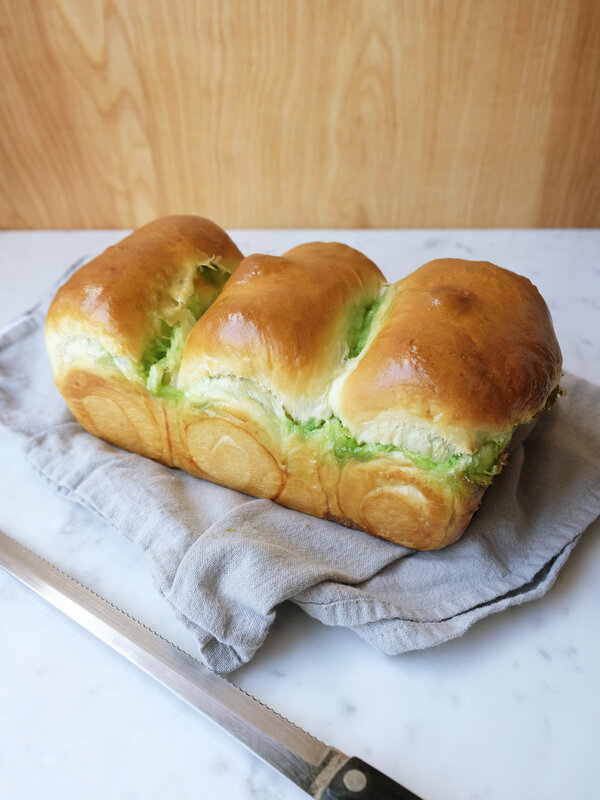 The addition of Pandan gives this bread an alluring green color and adds a wonderful sweet floral note. Pandan is a topical plant native to southeast Asia. It can be used like vanilla and imparts a floral, earthy and tropical flavor to baked goods. Often you can find fresh or frozen leaves in asian supermarket. If you find actual leaves, google Thai Pandan Wrapped Chicken (Gai Hor Bai Toey, marinated chicken deep fried in wrapped leaves. It's so good! This bread uses a Tangzhong Roux. The roux is a Chinese/Japanese method made of cooked flour and water (or milk) and can be used in all manner of bread. The roux gives the bread a more tender crumb and helps makes the bread last longer. Because the flour in the roux is already cooked when it is added to the dough, it doesn't develop gluten during kneading, enabling a higher moisture content and a lighter and softer final bread. While the roux might sound tricky, it's not! Since this bread was so easy, I might try to make some more Asian pastries with this same method. This bread is such a great base for so many other types of fillings: red bean, coconut, and taro and other Chinese Dim Sum staples likes Pork Buns, Cocktail Buns, and Pineapple Buns. The possibilities are endless! Pandan extract can be found in Asian supermarkets or made from frozen or fresh Pandan leaves. Alternatively, if you can't find the extract the bread can be made plain without any filling - it'll still be delicious! Note that this recipe calls for active dry yeast, not instant yeast. 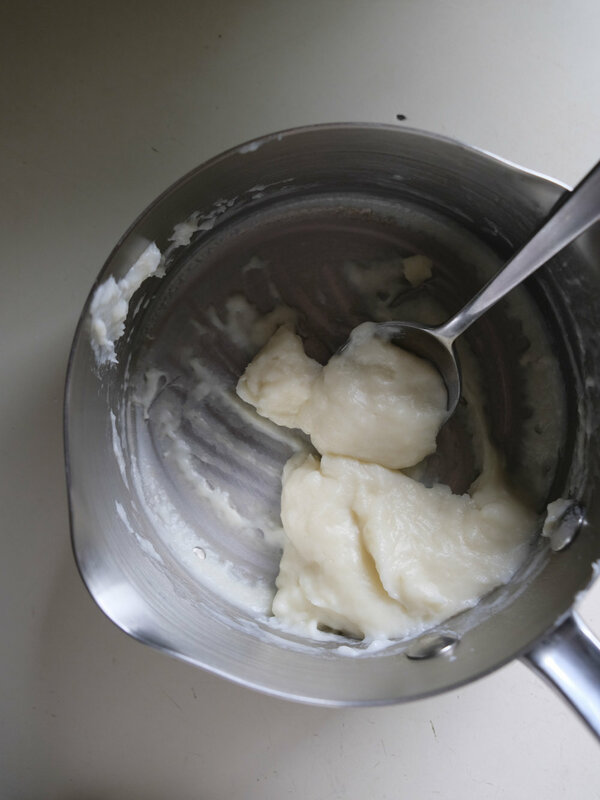 Make the tangzhang roux: whisk milk and flour together in a small saucepan. Heat over low heat whisking continuously until the mixture reaches 149° and is very thick like pudding, about three minutes. Place the roux in a bowl and cover with plastic wrap and let cool until room temperature, about an hour. Make dough: warm milk in a heatproof bowl in the microwave until 100° - 110°. Stir in active yeast and a pinch of the two tablespoons of sugar. Let yeast/milk mixture stand at room temperature until yeast is active and bubbly, 10 minutes. Whisk bread flour, salt, and remaining sugar in the bowl of a stand mixer. Stir in yeast/milk mixture, egg, and cooled tangzhang. Using dough hook, mix the dough on medium low speed until incorporated. Dough will be sticky. After five minutes, use a spatula to scrape the dough from the bottom of the bowl. Turn mixer to low and add butter in a piece at a time. 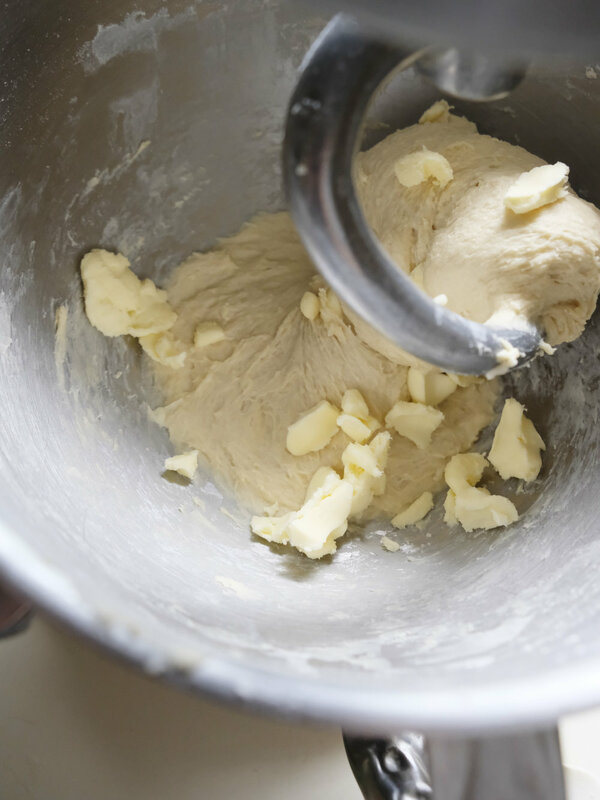 Once all butter is added, scrape any remaining dough stuck to the bowl and turn mixer to medium speed. Knead the dough for 6-8 minutes until dough cohesive and shiny. The dough is ready when, using floured fingertips, a piece of dough passes the windowpane test. Turn dough out of mixer bowl onto a lightly floured counter. Knead into a cohesive ball and place in a greased bowl. Cover bowl with plastic wrap and let rise in a warm place until doubled in size, 1 - 1 1/2 hours. Meanwhile, make Pandan filling: in a medium bowl, use spatula and mix butter until softened and lightened. Add coconut, sugar, milk powder, whole milk, pandan extract and pinch of salt. Mix until pandan extract is cohesive and coconut is evenly colored. Cover filling with plastic wrap until dough is ready. Lightly grease a 8" x 5" loaf pan. Turn dough onto a lightly floured counter. Punch down dough and divide and roll into three tight balls. 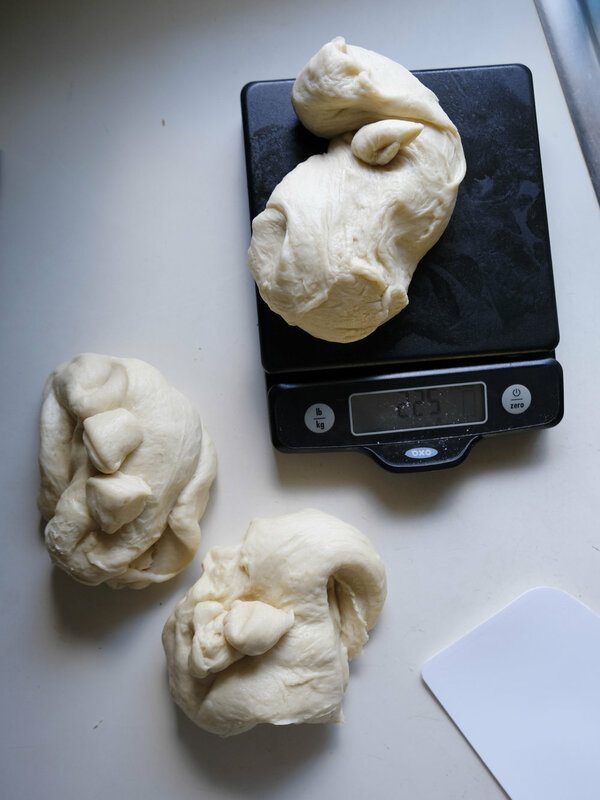 Working with one ball of dough at a time, roll one ball into a rectangle roughly 7" x 12" with the short edge parallel to the edge of the counter. Spread one third of the Pandan filling in a thin layer on the middle four inches of the dough. Fold sides of dough over the filling and pinch the seam. Roll the dough into a cylinder and place seam side down in the prepared pan. Repeat with remaining two balls of dough. Cover pan loosely with plastic wrap and let rise until dough reaches the top of the pan, 30 minutes to one hour more. Preheat oven to 350°. Lightly beat remaining egg and add a pinch of salt. Brush top of bread lightly with egg wash. Bake bread for 30-35 minutes until golden brown. If bread browns too quickly towards the end, cover with aluminum foil and continue baking. Internal temperature should be 200°. Let bread cool for five minutes in pan, then remove and cool on wire rack.